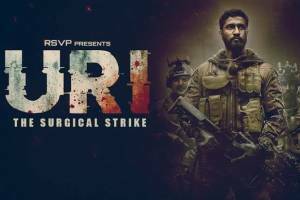 URI: THE SURGICAL STRIKE is based on the true events of the surgical strike carried out by the Indian armed forces following the September 2016 Uri attacks, which was termed as one of the deadliest attacks on the Indian forces. The film opens depicting Indian soldiers being ambushed in Manipur, followed by retaliation by the forces on terror bases across the India – Myanmar border in the North East. From there, the story follows Major Vihaan Shergill (Vicky Kaushal), who seeks retirement owing to his mother’s ill health as she suffers from Alzheimer’s disease. In the meantime, Pakistani terrorist outfits carry out an attack at Uri Army Base camp in Kashmir. Vihaan’s childhood friend and brother-in-law Captain Karan Kashyap (Mohit Raina) along with some other fellow army mates are martyred in this attack. Following this, Vihaan is forced back by emotions to extract revenge by leading the strike force. Vihaan puts together a team to conduct the surgical strike under the guidance of PMO bigwig Govind Bhardwaj (Paresh Rawal) with special orders from PM (Rajit Kapur) himself. Special Agent Pallavi (Yami Gautam) helps Vihaan to detect the location of the launch pads and details of the target. And what follows is the execution of the surgical strikes across PoK.